Previously an unclaimed piece of land in the North Atlantic Ocean, a group of wealthy philanthropists – Campbell Smith, Benoit Lecache, and John Solomon have wholly renovated the island into a secluded haven of civilization, all built around the philanthropists’ dream – a palatial school built for higher education for the most elite of today’s youth: Renaissance Island School for the Elite, known colloquially as Ren High. Around this magnificent school, the founders built a comfortably-designed city, complete with elegantly simple residential areas, and an expansive shopping district. The lush scenery and beautiful beaches naturally complement the additions made by the founders, making Renaissance Island nothing short of an intellectual’s paradise. The namesake. A massive school for advanced learning. A quiet, grassy park, with some playground equipment for children, jungle gyms, sandboxes, and other necessities. Students often come to relax, or read, or simply hang out here. Up on a nearby hill, several benches sit facing a beautiful view of the ocean, towards the setting sun. An expansive shopping mall on the east side of the island, this mall contains a multitude of stores, a movie theatre, and other amenities. 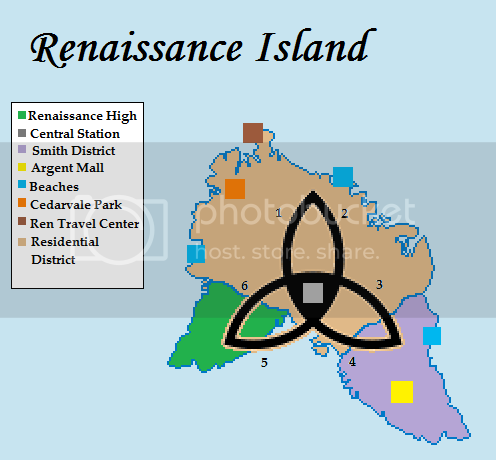 Three different beaches, located around the island in almost a triangle pattern. There are some dank caves around the coast of Penseur beach, and the wind blowing through these rock formations causes a curious moaning noise - the subject of many a ghost story in the school. Solomon's pride and joy, this train system runs in almost a celtic-knot shape, providing transport to and from everywhere on the island. There are stations in each main district, with one Central Station in the direct center of the island. The only way to leave, and the only way anyone can arrive. The Travel Center supports both air and sea travel, both for commercial purposes and personal enjoyment - some of the richer students rent docks to keep their own personal vessels in. Named for one of the founders, the Smith District is home to all kinds of shops and services not found in Argent Mall. Barbershops, dry-cleaning services, used-book stores and all kinds of shops line the streets. A community billboard and a quaint, wide water fountain rest at the center of this area - often, "help wanted" ads and other announcements can be found on the billboard. Other job opportunities and buy/sell sections can be found in any newspaper, found at any local convenience kiosk around the island. Surface Bio: Their personality as they project it; how they are seen by others, and what someone might take away as a first impression. This doesn't have to go into much detail, as getting to know each others' characters through social interaction and conversation is an integral part of the story. Although the expectation is that the character is an incoming student to Ren High, you are not restricted to this. Appearance: What they look like. This may be description, or sprite, or both. Family: Whether they live with anyone, or came with family to the island. If not, simply say so. Arcana: You must select an Arcana from the list below. Arcana is given on a first-come, first serve basis. The post will be updated with taken Arcana. Once we have a couple players, we will begin. Time will pass in days, beginning in September a day before the beginning of the school year. Each school day, students will have class, and then will have the option to take ONE action – ie., visiting various locations around Ren Island, hanging out with a friend, extracurriculars, etc. – before returning home. Other actions may eventually become available at home as the story continues. Also, Toku LOVES to make school based RPs. And no, not necessarily. Would a Persona game be anywhere else? Title updated with link to tentative theme song! im considering drawing my character for this. edit: its probably because of that theme song. Edited by M.C MyZtery, 29 October 2010 - 03:37 AM. Surface Bio: Isato seems cold, unemotional, and unsocial. Content to sit in the corner, as if he can't be bothered to interact with others. Appearance: Thin and pale, Isato doesn't look as fit as he is. He usually wears a white dress shirt tucked into plain white slacks with a black belt. He wears square-rimmed glasses, and keeps his jet-black hair at around chin-length. His eyes, slightly slanted, are a dull turquoise. Family: Isato lives in the dorms by himself. He was the only one in his family offered a scholarship, and they couldn't afford to pay to have her sister go to school at Ren high, so he came alone while his parents stayed to take care of her. Also note that as this is not set in Japan, characters don't all need to have names like Akihiko or Satonaka. Neither is there a dress code. Not pickin' on Rentok, just clarifying. Isato Hasai has been my character name in every SMT game I've played so far except MegaTen. I am going to use it here as well. Haha, not picking on you, like I said. Don't forget that I need a profile in my inbox too. Oh, all characters start with $10. Surface Bio: Agatha Ganning is a very attractive child, very intelligent and very graceful. She is aloof, however, and does not take easily to strangers. She is greatly advanced in school because of her intellect, which exacerbates her social inequity. She has a tendency to be selfish and manipulative of others, but can be very generous to her few friends. Appearance: Very attractive, has a tendency to captivate others. Raven-haired. Grey eyes. Dresses in a somewhat minimalist manner, in toned-down colors. Browns, Black, Beige. 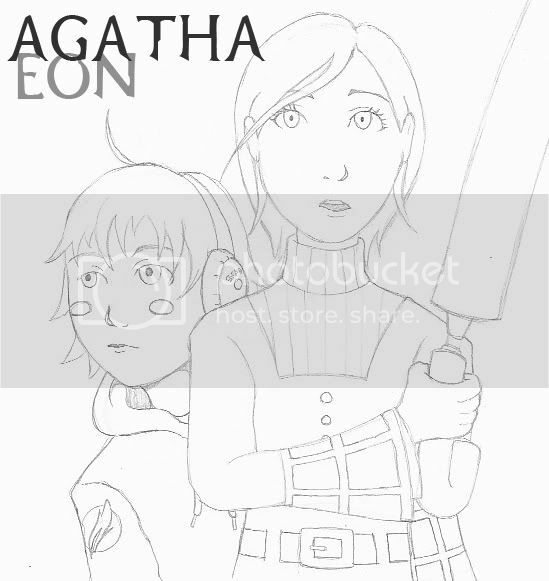 Family: Agatha's parents were... not there. She lived with an elderly friend of her grandmother, who recently passed away. She is living on the island on private funding due to her excellent academic credentials. Age: 16, but is almost 17 (October 4) so he just says he is 17. Surface Bio: Basil is one of the incoming students given a scholarship for his brilliance in a school overseas. He is fluent in Japanese, however he is a transfer student from London. He comes across as a brilliant, but distant character seeming off in his own world at times. While he isn't devoid of emotions he feels that important decisions can only be made when a person can distance themselves from emotional connection to a situation. On one hand, this leaves him rarely biased in making a choice, but at the same time can make him seem cold though he isn't meaning too, he's just trying to be unbiased. However, when it comes to hanging out with friends and having fun he seems as light and carefree as can be. The rational calculating nature only comes out when given a choice. He is a vast supporter of law and desires to be a detective when he gets old enough. As such he almost always jumps to the defense of those being hurt, his rational side being thrown out the window in cases of somebodyelse's safety. Appearance: Basil tends to wear almost all black at times, usually wearing black scrub pants, black t-shirt, and a black trenchcoat that he wears regardless of the weather. He was given the coat by a now dead uncle so it carries an emotional connection to him and he feels naked without it. He has dark brown hair that is usually gelled back, though there are times when he wakes up too lazy to mess with it. It is short enough though that it doesn't usually matter. His face is covered in light facial hair that forms an thin beard. Family: Basil's family lives in London other than his older sister. His father works there as an attorney and his mother is a police officer. His sister, while his current 'legal guardian' is normally out of town, though she swings by the school to check on him every so often to keep the parents happy. That makes three completed characters, 5 potential. Never played the games... but damn. I want in. Name is influenced by Of Mice an Men, tbh. Surface Bio: A freshman, born in the summer, in America. He appears happy, carefree, and unhurried where others are stressed. He cares more about having fun, or being lazy, than doing actual work. A strong believer in what he calls Lady Luck. He acts a bit strangely sometimes. How he got into Ren High, no one knows. He makes friends easily, and loses them the same way. He prefers to have a lot of friends rather than a few close ones, though he does spend more time hanging out with a few people. Appearance: Black hair, not long or short. A sloped nose, half-closed eyes, and a small smile give him the look of a slacker. He's pretty tall, and slim, but not threatening-looking. He wears cargo shorts, a skull-and-crossbones black T-shirt, and occasionally he wears a jacket. Family: Lives alone near the campus- no one knows exactly where. Alright, I guess I can conclude that there's definitely interest. Shall I do the "brochure" writeups of those locations then? If that's what floats your boat, homie. I'm down. Surface Bio: Careless and outgoing, Fabian cares little about what happens in the world. He appears to have a childlike curiosity and innocence to him, and happily talks to anyone he runs across. He is also notable for his vulgarity, and apparent lack of any knowledge for social etiquette. Many of his actions are not driven by any need or want, but rather for experience. It has been said that he is at least somewhat brilliant, but he refuses to outwardly show this side of himself. He has also been marked as a womanizer by his peers. Fabian is friends with nearly everyone, but close to very few, as he rarely reveals any information about his personal life. Family: Nobody knows much about Fabian's family. He lives alone in the city in a well-furnished apartment he rented out. Whether he inherited some vast sum of wealth from his family or gained the money through other means, Fabian could hardly be described as stingy with the money he has. He supposedly has a sister. I barely get this reference, but I know it's to Frick, who I barely knew, kinda. Also, your sig reminds me of the South park episode Insheeption. Damn good. Its not to Frick. Me and Frick just agreed over the use of flannel. You're probably too young to know, lol.